Worried about a problem tree on your land? Concerned that a tree has been damaged and poses a threat to your property or to visitors to your garden? If you need a skilled tree surgeon in Hertfordshire or surrounding counties for emergency tree work, call Ricky Tyler Landscapes today. Experienced, qualified and fully insured, you can count on our tree work specialists to get the job done quickly, safely and for a great low price. Looking for regular tree maintenance? If you need branch pruning for an overhanging limb or vista pruning to stop light blockages, we can create the right result for you. 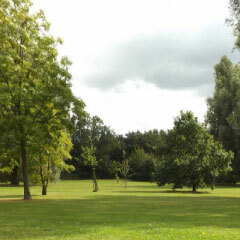 We take care of trees and hedges for private grounds and for parks, businesses, conservation projects and local authority premises. Have you got a protected tree to consider? Need to obtain planning permission before it can be worked on and removed? Ricky Tyler Landscapes is a qualified tree surgeon and approved to carry out work where Tree Preservation Orders (TPOs) are in force. If you're unsure where you stand or if you need help with a planning application, we'll talk you through the process and provide you with all the advice and information you need. All work is carried out safely by insured professionals, and we're dedicated to providing an eco-friendly service. All felled wood is recycled for firewood, sawdust and woodchip, ensuring that there's no mess or waste when we're through with our job. When you're looking for tree surgeons in Hertfordshire, call our tree care technicians and arrange your appointment. We can also carry out grounds maintenance and landscaping for you, install fencing and keep your garden looking fantastic. 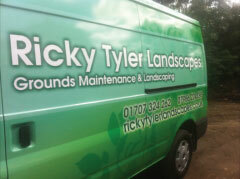 Ricky Tyler Landscapes can provide gardening and grounds maintenance services including Tree Works covering London, Essex, Hertfordshire, Northampton, Buckinginghamshire & Bedfordshire .